Ever since pictures for the first 1H2011 sets started appearing, the FOLT (Fans Of LEGO Technic ) community latched onto a new part present on the 8069 Backhoe, looking like a miniature of a Linear Actuator. Since it is significantly smaller than the LA we all know and love (and some hate...), it has been discussed if a part with this size and functionality is possible for a feasible cost. Two theories emerged: the first says that the Mini LA (called "mLA" in the rest of this post) is too small to work and is just a decorative element, like the Technic Axle Joiner Perpendicular with Extension, and the second says that it is a truly functional element. The mLA might work similarly to the regular LA, but without the external, fixed sleeve. 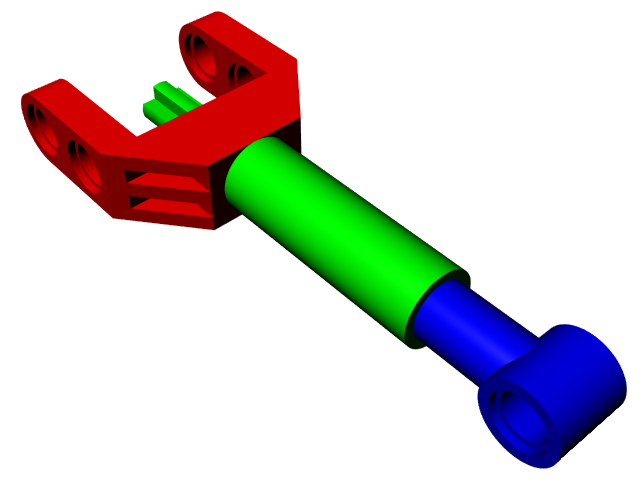 It may be composed of three sub-parts, marked in these pictures in different colours: the red bracket, the green sleeve and the blue piston. The bracket, unlike the regular LA, is permanently attached to the rest of the part to allow for an overall smaller size. The screw has an input axle instead of an axle hole, unlike other Power Functions parts like LA's and motors, also to save on size. The piston doesn't differ much from the regular LA. 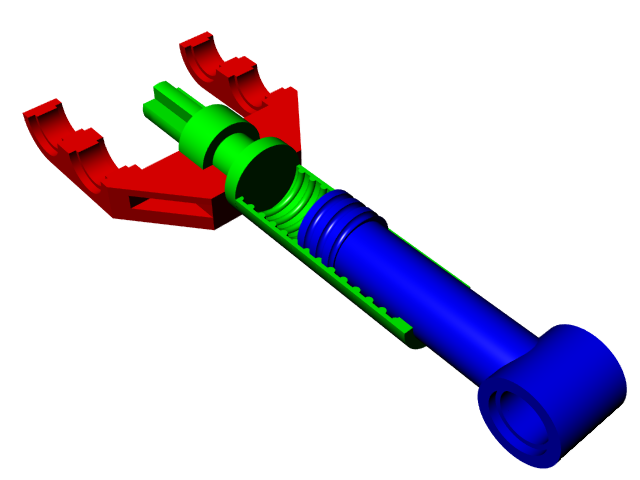 When the input axle is rotated, the whole outside rotates, unlike the regular LA, which has a fixed shell over the rotating sleeve. The inside of the sleeve is threaded, which, when it rotates, pushes or pulls the piston. To save costs (four mLA's on a 49.99€ set, when a set with four regular LA's costs a LOT more), all the sub-parts are probably made in plastic. This reduces the strength of the part, but, since the expected loads are also smaller, this shouldn't be a problem. For a comparison, the large Pneumatic cylinder's piston is metallic, whereas the smaller version's piston is plastic. Unlike the regular LA, there should be no room for any integrated protection mechanism to prevent straining the mLA when it reaches the end of its travel... but judging by the general opinion about the regular LA's protection, nobody will miss this feature. This theory has the obvious disadvantage of the whole outer casing (save for the bracket) spinning when working, and that's blatantly unrealistic. Also, the sleeve must be securely attached to the bracket, so that it doesn't come off under load. The cutaway image I made shows a possible solution, but I'm not sure how that detail can be manufactured cheaply and effectively. On the bright side, I think this is the simplest design that can work. Not many months left to know for sure... In the meanwhile, do you think mLA's are just decorative, or do they work differently? This is certainly the most likely all plastic solution. I believe there will be metal parts, so I think the alternative solution (where the rod acts as a sleeve) will be used. This would be stronger, but would probably generate more friction. Thanks for your wonderful sketches Alexandre! I can see another way to make it work (sorry, I have not prepared a sketch). The sleeve and bracket would be one single part (no sleeve rotation and no screw). Then two inner parts allowing inter-rotation along the axis: One base with axle or axle-hole and a protruding screw axle in the opposite direction (this whole part could be metallic), and one hollow plastic rod with screw, sliding into the sleeve as the base rotates. Great post AVCampos, very well done. In spite of being functional,I don´t think that solution is very strong and durable for the kids and for us to play. 3 separate plastic parts (with 2 of them moving) are definitely more clumsy than the lLA (large linear actuator)solution with only one moving part. Since the mLA will be "cranked" up and down via knobs (and not Power Functions motors), the movement should be quite slow. I think the first sketch reflects the (simple, low-cost) version that TLG will end up manufacturing. This seems a working possibility, but as designed there is no way to put the screw in the body (no thread on tip). So it would probably need another (glued) part to close the body after the piston is inserted. The green part and the rod are both made of metal. Yes, that basically fits my view as described above. It might have the same problem as described by Philo, if we don't want the rod to pull-off easily. However it could be overcome, if the rod has a small edge on the bottom and gets into the sleeve with a small pressure. Personally I think the outer sleeve is fix to the base, not rotating. The blue part is a hollow tube threaded up the middle with a threaded rod running up the middle of that to the axle at the back. If the green part were not to be fixed to the bracket, then, when contracting the actuator, it would come off. Thus, it has to be fixed, right? @Conchas and Anonymous: I thought about that possibility too, but it appeared to me too expensive/cumbersome to be applicable on such a small size and in such large number on a set in this price range. In fact, that's the exact mechanism I thought about many years ago and suggested to LEGO (and in which I stupidly forgot to include the picture I made at the time), and which I thought the standard LA's used. @Philo: Yes, that's something I too saw on the proposed design, and the only possibility I saw was that the bracket is composed of two assembled halves, possibly glued. One of them could be something like in the cutaway drawing, except that the mounting axleholes would be completely part of one of the halves. When I have time, I'll try to do some sketches of both the three-layer suggestion and how the two-layer suggestion could be assembled.